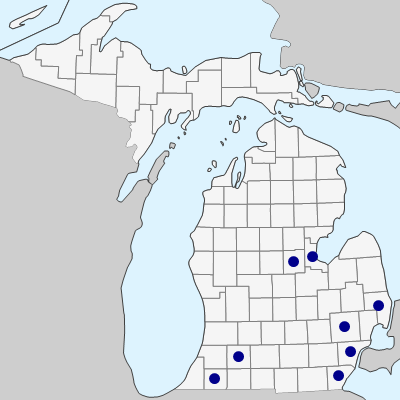 Parasitic on numerous hosts; those documented in Michigan include species of Mentha, Euthamia, Symphyotrichum, Stachys, Ceanothus, Amphicarpaea, Solidago, Bidens, Monarda, Symphoricarpos, and Corylus. In its distinctive ± fleshy papillate perianth and thickened summit of the fruit, this species resembles C. indecora, from which it differs in its 4-parted (though occasionally 5-parted) smaller flowers (ca. 2 mm long before enlargement of fruit). 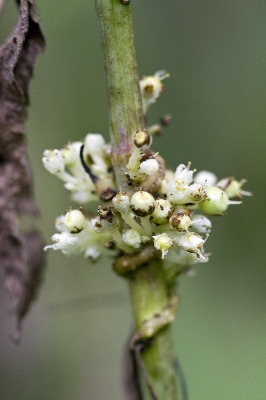 Frequently at least some of the pedicels equal or exceed the flowers (not fruit) in length, giving the inflorescence a more open aspect than in some other species. MICHIGAN FLORA ONLINE. A. A. Reznicek, E. G. Voss, & B. S. Walters. February 2011. University of Michigan. Web. April 21, 2019. https://michiganflora.net/species.aspx?id=852.